Ahead of the annual round of London auctions held in March, Beares Auctions announced a new direction for the auction wing of the established shop, John & Arthur Beare. Under the banner of “Moto Perpetuo,” Beares’ will offer instruments and bow auctions in a new way. According to the company’s February 16 release, items may come up for competitive sale as they become available, giving buyers access to new stock constantly while offering sellers an auction focused on their instrument. Some items will be available with a “buy now” option for one week before the three-week auction period begins. This new system may give sellers and buyers more flexibility, while making public auctions more like private deals. In a move that appears to make public-auction sale prices private, once sold, items are removed from the site, making it impossible to track sale prices and market trends. During its first Moto Perpetuo auction, Beares sold several choice pieces almost immediately, including a circa 1865 silver-mounted Nikolaus Kittel cello bow and a 1788 François Lupot violin. Amati, which has been having a mix of general auctions and trade auctions, sold a Johannes Theodorus Cuypers violin, made in The Hague in 1797 for £24,000; a Hungarian-made violin, possibly by Samuel Nemessanyi circa 1870, sold for £49,020; and a silver-mounted cello bow Eugène Nicolas Sartory sold for £19,840. 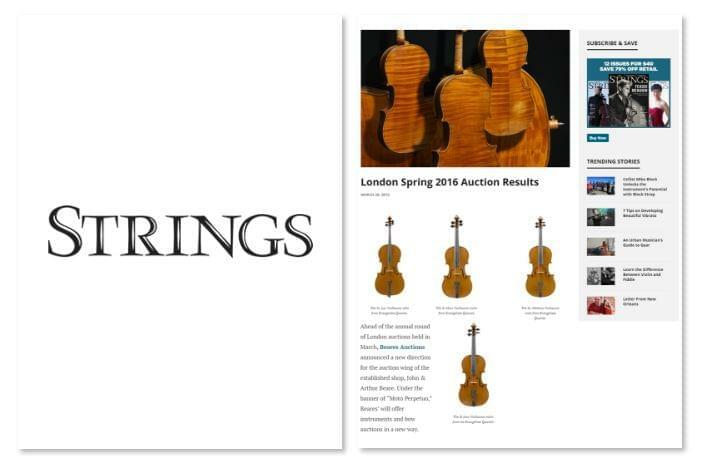 The big seller at Brompton’s March auction was a Carlo Ferdinando Landolfi violin, made in Milan in 1755, which sold for £180,000, while a French cello made by Gustave Adolphe Bernardel in ca. 1870 sold for £52,800 and a ca. 1770 English cello from Benjamin Banks sold for £45,600. A ca. 1907 silver-mounted Sartory violin bow, sold for a handsome £21,600, far above its pre-auction estimate. Ingles & Hayday had what was certainly the most interesting item in the March auctions, a rare quartet by Vuillaume. The “Evangelists” quartet is the only one of four quartets made by Vuillaume and is the only quartet that remains a complete set today. While the other three quartets were decorated with the coat of arms for the families that commissioned the sets, the Evangelists quartet features instruments named after the authors of the four Gospels from the New Testament in the Bible: Matthew, Mark, Luke, and John. Vuillaume made the quartet of Stradivari-based instruments from matching wood in 1863, naming each instrument after a saint. All feature the saint’s name inscribed below the bridge and an original tailpiece carved with an image of each instrument’s namesake: the St. Jean violin, St. Marc violin, St. Mathieu viola, and St. Luc cello. The Evangelists quartet is in outstanding condition and has been in private European collections since about 1970, including in the collection of French expert and collector Étienne Vatelot from 1975–2008. The instruments feature certificates from Vuillaume experts Jean-Jacques Rampal and Vatelot. The quartet had a pre-sale estimate of £600,000–£800,000, but sold for a noteworthy £960,000. That works out to £240,000 per instrument. For comparison, Ingles & Hayday also sold an 1844 Vuillaume violin and a ca. 1845 Vuillaume cello in the same auction, with each instrument selling for £144,000. In addition to its yearly March sale, Tarisio held its inaugural February New York–based sale, too. Both sales featured several record-setters. The London sale in March set records for a ca. 1730 violin by Francesco Goffriller, who worked in Udine after separating from his father Matteo, at £140,600; an 1869 George Chanot II violin that sold for £36,000; and a gold-mounted viola bow by Jean-Jacques Millant that went for £7,200. The sale’s top seller was a ca. 1855 Vuillaume violin, with a one-piece back, that sold for £143,000. Highlights from the New York sale include a violin made by Andrea Guarneri in collaboration with this son Giuseppe “filius Andreae” that sold to a musician for $200,600; $102,000 for a 1997 violin made by Samuel Zygmuntowicz; and $144,000 for a violin made in Turin in 1734 by a highly regarded maker who doesn’t enjoy the name recognition of some of his contemporaries, Giovanni Francesco Celoniato.